WASHINGTON — The Block III Super Hornet is getting a marginal increase in stealth capability, but if you’re expecting the invisible aircraft of President Donald Trump’s dreams, think again. Trump was referring to one of the Super Hornet’s Block III upgrades slated to be incorporated on jets rolling off the production line in 2020: the application of radar absorbent materials or RAM, also known as stealth coating. 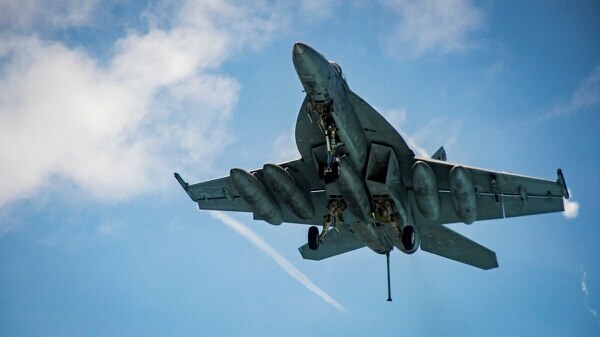 But far from being “the latest and greatest,” the company has already used the exact same materials on the on the Block II Super Hornet to help decrease the chances of radar detection, said Dan Gillian, who manages Boeing’s F/A-18E/F Super Hornet and E/A-18G Growler programs. Block III jets will get “a little more” of that coating applied to them, “and in a few different areas to buy a little bit more performance,” Gillian told Defense News in a March interview. All in all, those improvements will reduce the aircraft’s radar cross section by about 10 percent, and with very low risk, he said. Although the general public tends to think of stealth like the invisibility cloak from Harry Potter or Wonder Woman’s invisible plane, stealth is more of a continuum that is enabled and affected by many factors, experts told Defense News. “It’s not a Romulan cloaking device,” said Richard Aboulafia, a Teal Group aviation analyst, referencing a technology from Star Trek that allowed spaceships to be invisible to the naked eye and electro-optical sensors. The most important contributors to low observability are the aircraft’s shape and the use of LO coatings, with airframe shape commonly seen as twice as important as the coatings, he said. Stealth fighters from the oddly angled F-117 to the F-22 and F-35, with their rounded edges, were all designed to bounce radar waves away from an aircraft, sometimes at the expense of aerodynamic performance or other attributes, said Brian Laslie, an Air Force historian and author. That being said, the Super Hornet, with it’s external stores and pylons, is not going to replicate the low observability of the joint strike fighter, which was designed from the beginning with stealth in mind. “But just because it’s not a pure LO aircraft doesn’t mean that the designers weren’t concerned with the radar return,” said Laslie, who added that it’s “reasonable” to expect a 10 percent decrease to the aircraft’s signature by augmenting Block III jets with additional RAM coating. Shining a spotlight on the Super Hornet’s low observable attributes may have helped sell Trump on future orders, Aboulafia speculated. “It might be useful in the real world too, but in a much more marginal way,” he said. One of those benefits, according to Laslie, is that the LO performance upgrade could also enable the Navy to be more flexible in its mission planning. An aircraft can be more or less easily detected by radar depending on how it is positioned or the route used by the plane, so having more radar-absorbing materials on the Super Hornet could give the pilot more options. “I think what the Navy is doing is trying to maybe reduce enough of the cross section of the F-18 in high intensity combat scenarios,” Laslie said. While the president has done much to focus public attention on the Super Hornet’s upcoming LO upgrade, the Block III actually offers a relatively modest increase in stealth compared to earlier concepts floated by Boeing. In 2013, when the company began evaluating how to attract future sales from the Navy as production slowed, it started promoting an “Advanced Super Hornet” configuration that would have improved the aircraft’s signature by 50 percent. That version of the jet included structural enhancements and an enclosed weapons pod, but Boeing ultimately stepped away from that concept. “Those big compromises you have to make to get the higher levels of stealth like putting your weapons in a bay, we don’t think that’s a necessary part of the Block III story for the Super Hornet,” Gillian said.